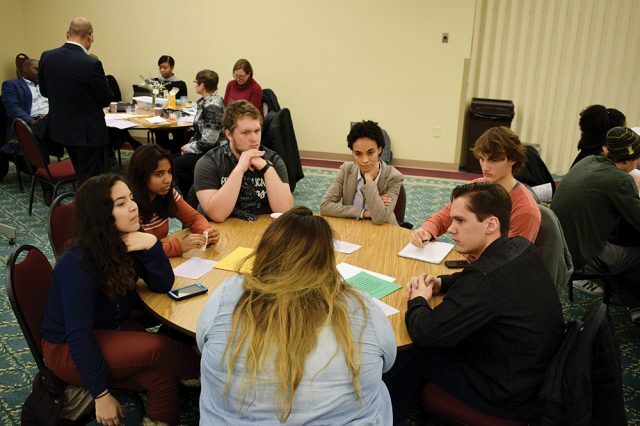 Following a weekend full of events celebrating Martin Luther King Jr., Goshen College students, faculty and staff gathered for a town hall meeting in the fellowship hall of College Mennonite Church. Gilberto Perez, dean of students, opened the townhall by naming how he envisions the beloved community here at Goshen College growing. One way Perez shared that he and others hope to create the beloved community is by creating what they are hoping to call Open Space. An open space where students, faculty and administrators can come and have conversations about equity, diversity, water justice, climate justice and many more things. The Open Space will be held in Wyse Hall student lounge and will be a place for students to share their thoughts. Individual meetings with affinity groups such as Black Student Union (BSU), Latino Student Union (LSU), Prism, Advocates, Eco-Pax, International Student Club, Goshen Student Women’s Association will also be held to better understand how they are experiencing Goshen College. Perez then introduced Jason Shenk, leader of the People’s History of Elkhart organization and active in the effort to build a new Poor People’s Campaign in Elkhart. It is envisioned that Shenk and other supporters of People’s History of Elkhart will be a part of creating the Open Space on campus to talk and engage in the issues above. Perez made sure to recognize the members of racial misconduct team who are also available on campus to provide support. These members include Dr. Jose Rocha, Dr. Regina Shands Stoltzfus, Dr. David Lind, Richard Aguirre, Angela Forest, BSU advisors DaVonne Kramer and Rev. LaKendra Hardware, LSU advisor Rocio Diaz and International Student Club advisor Skip Barnett. There was a time of sharing with the bigger group thoughts and reflections responding to these questions. Due to being short on time, not all of the questions listed were discussed. “We hope to create an environment that is centered on trust, transparency, support and vulnerability, accountability and relationships,” said Perez.